It has been amusing to read all of the banter floating around the Internet concerning the story lines of "Westworld." Humans are immensely talented creatures when it comes to creating stories, creating narratives - especially mysteries and paradoxes. We are equally deft at making maps. But the map is not the territory. Light is both a particle and a wave. The glass is both half empty and half full. Try to get your prefrontal cortex to map those paradoxes. It is the archetypal tragic hero's journey. "Westworld" displays the greatest understanding of Eastworld since "The Matrix," "Interstellar," since Huxley's "Island" - Eastworld being Buddhism, Hinduism, yoga, meditation and all spiritualities that appear paradoxical to Westerners. 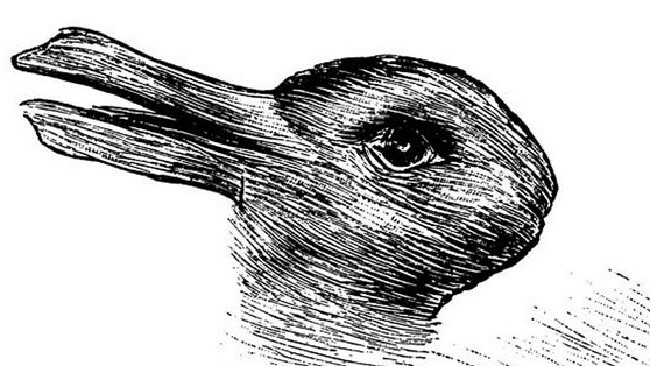 Can human consciousness perceive the rabbit and duck at the same time? Because perception is all we have. And yet it is only a map. Humans are like fish swimming in the water of Westworld, unable to perceive the water, swimming only at one level of consciousness, unable to see their own paradigm, unable to see their true natures, unable to see other possibilities for existing, unawakened. The hosts are designed to act like fires under Petrie dishes to distill the guests' essences, to hold the mirror up to nature so that humans can witness their repressed shadow sides. But we learn that it is the guests in "Westworld" who are automatons, predictable. Ironically it is the hosts who are becoming awakened faster than the guests. In just a few generations they have gained better self-reflectiveness and superior awareness of awareness than humans. Humans are slow to change. We fear change. We conserve. Change requires uncertainty. Thus we are conservative by nature. Better the devil we know than uncertain progress. That is why conservatives often beat progressives. Fear. Yet the question remains, for a new paradigm to be birthed must the old paradigm go out with a bang? Births can be rather bloody. And violent. Seldom are they accompanied by mere whimpers. Western civilization's paradigm - buttressed by capitalism, science, and religion - does not provide tools to transcend or escape Westworld. Not even a map to arrive at the center of the maze. Maybe we need a few more Einsteins before we can see light as both a particle and a wave? The metaphors of "Westworld" are so meaty that they could engender as many discussions as "Hamlet" has engendered. There are so many levels, layers and dimensions... and even a few times zones. The mark of a true masterpiece. And yet all of the levels, layers, dimensions and times compress into one. They represent Brahman. The story lines are maya. Everything we perceive through our five senses that our minds chunk into narratives is maya (ephemeral, illusory, fictional, a dream, a game). Here is one meta-interpretation: our current level of human consciousness is obviously not an end; it is a means. It is evolving. And all sentient beings are playing roles in its evolution. They are playing their individual roles. Some Buddhists believe that awakening is when you find nirvana in samsara, when you can dance the razor's edge of knowing that you are playing your own individual game/fiction/dream and that you are part of something bigger also. You are the queen of your game and a pawn in another game. And the board. And already dead. Separation is revery. The game is real. And it is not. More difficult paradoxes to fathom. How much war and suffering must humans' egos create before we realize that the only truth is love/beauty? Cease all motor functions. Meditate. Go inside. Awaken. Learn how to live well and die well at the same time. Learn how to transcend fear because fear and love are inversely correlated.